Sure, it’s winter, but Watts Bar waterway never freezes. Many residents of Crossville take advantage of this big, deep water in the shadow of the Watts Bar Nuclear Plant. The Watts Bar Lake reservoir covers 39,000 acres, with some 780 miles of shoreline. The Dam was built in 1942 by TVA for flood control, power supply and recreation. There are many coves and islands to explore, many depths to drop your baits down into, and beautiful vistas to admire. We took the opportunity to fish on our visit. We caught a couple of nice, big crappie, walleye, fat largemouth and smallmouth bass. 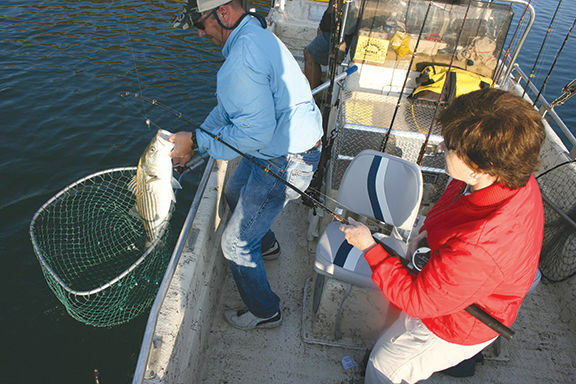 On another ride over, we found a guide to take us for big striped bass. Swimming down deep are the jumbos: huge catfish. Catfish varieties such as Blue Cats, channel cats, flathead cats, brown and yellow bull heads.